All transactions are safe and secure with a reliable history in online purchasing behind each of our associates. Buy the White Filigree Eclipse t-shirt to own Eclipse clothing and merchandise. 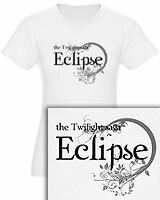 For those of you who can't pick a favorite character or have picked a less common favorite like Charlie Swan or Billy Black, this Twilight Saga Eclipse t-shirt should work nicely for you. It is available in a wide variety of colors and styles for both men and women. Select whichever suits your style and snag one for your best friend too. Make sure you also take a moment to check out the Twilight Eclipse jewelry that's available below, including Bella's moonstone ring and Bella's engagement ring. In addition to the White Filigree Eclipse tee above, browse the Eclipse Clothing Gallery for more apparel like men's and women's clothes, kids shirts or hoodies.